Nobody wants to be all set to go out and tend to their busy schedule only to find that their car is trapped in the garage because the door won’t budge! 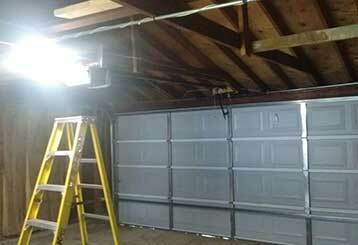 Rather than simply hope that won’t happen, help make sure it won’t by getting periodic garage door maintenance. Our professionals will be able to note future issues in the making now to get them tended to so you won’t have to worry about them later! It can also help elongate the health and durability of your door overall so it'll keep working for you for a long time. Save yourself the future hassle and get it all tended to sooner rather than later! Have you noticed a lot of noise from your door as it tries to move along the tracks, as well as a draggy and slow nature to it? Especially compared to how it used to be? That means that it’s time to get the parts lubricated! Part lubrication is just like oiling a door hinge, it helps make things move easily and smoothly and without the noise. Along with this, it can also help the longevity of the parts themselves! The springs and other parts can get brittle over time and more likely to break, but lubrication helps ease this issue. One of our professionals would be glad to give your garage door’s whole system a thorough examination to check for signs of rust, too much wear and tear, or any other potential troubles that may be looming. There may be bolts that need to be tightened to prevent rattling, or more pressing things like a spring close to breaking, but it’s best to know now to get it fixed rather than be surprised with it later! Take the first step to ensuring that your garage door works as quickly and smoothly as possible by calling Garage Door Repair Seabrook today to set up a maintenance appointment!